Click the map for a larger view. In 2000, the Pew Environmental Health Commission published a report demonstrating an "environmental health gap" - a lack of basic information needed to link environmental hazards and chronic diseases - exists in the United States and called for a nationwide system to track and combat environmental health threats. 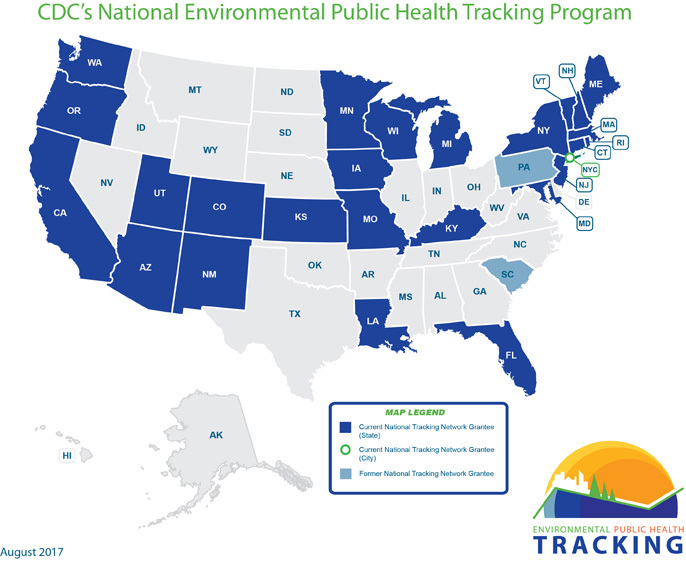 Beginning in 2002, the Centers for Disease Control and Prevention (CDC) began the process to develop this national tracking system by seeking proposals for funding cooperative agreements with state and local health departments, including the Massachusetts Department of Public Health/Bureau of Environmental Health (MDPH/BEH). A map of state and local program grantees is below. Information about partners in the National EPHT Program is available. As part of this effort, the CDC worked with the state/local and academic partners to develop a set of nationally consistent environmental and health measures that are reported on the National EPHT Program website.